In 1978 and 1979, short story writer Hecht (Do the Windows Open?) conducted sporadic, often frustrating interviews with the comedian Andy Kaufman for an intended Harper's magazine profile. Harper's deemed the piece ""too strange"" to publish; 20 years later, those interviews now appear in this odd volume. In 1978, Kaufman was a regular performer on Saturday Night Live; in the next year, he would originate the role of Latka on the sitcom Taxi. Hecht's first encounter with Kaufman was not auspicious: driving Hecht and collaborator Bob Zmuda to Manhattan from his hometown of Great Neck, N.Y., Kaufman took his hands off the wheel and began clapping along to the music on the radio. After he refused to attend to the wheel, Hecht demanded that he stop the car and let her call a cab. Later exchanges were similar, with Kaufman unwilling to play anything straight. Most of Was This Man a Genius? consists of transcripts of Hecht and Kaufman's conversations, where Kaufman comes off by turns petulant and na ve, obsessed with meditating and taking vitamins and perpetually making passes at the married Hecht. Though this approach vividly renders Kaufman's personal strangeness, the bickering grows tedious, and Hecht's general lack of explication doesn't help she doesn't even attempt to answer the question posed in the book's title. (Apr.) Forecast: Advertising in the New Yorker, which has published many of Hecht's short stories, may yield a few sales. 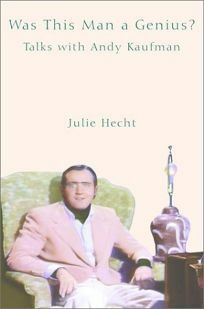 Still, coming so far behind Zmuda's Andy Kaufman Revealed and Bill Zehme's Lost in the Funhouse, and containing little new information, the publication of this tedious biography seems almost as puzzling as the performer himself.